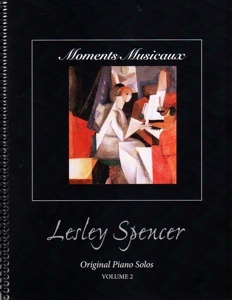 Moments Musicaux: Original Piano Solos, Volume 2 is the companion sheet music book to Lesley Spencer’s 2008 solo piano CD, Moments Musicaux. All sixteen pieces from that album are included, five of which belong to Solo Piano Suite II. This collection is even more varied than Secret Places Private Thoughts, and several of the pieces are more challenging. A few have fairly complicated rhythm patterns, but they can be mastered with diligent counting until the rhythm can be sensed and played freely. “The Path of My Soul” has somewhat challenging timing as well as some long reaches on the left hand that pianists with small hands may have difficulty with. “Fellini Waltz” has very long jumps down into the deep bass of the piano, and at least a few of the pieces are really fast. For somewhat more advanced pianists, those points only make playing this music that much more fun! Early-advanced pianists should have no problem mastering any of this music, and will have a great time doing so. 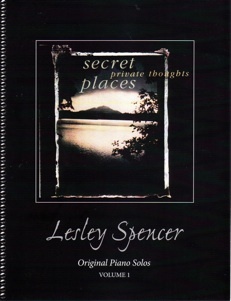 This book contains some of my favorite Lesley Spencer compositions: “Fellini Waltz,” “Ode To Harry Potter,” “Scherzo,” “Waltz For Keegan,” etc. The music was transcribed by Lesley Spencer and then edited by Rebecca Oswald and myself. Oswald is one of the most accurate and thorough transcribers around, and this book reflects her attention to detail. The notation is roomy and easy to read, and includes extensive dynamics and playing instructions, metronome settings, and pedal markings. The book is spiral bound and the paper stock is an excellent weight for easy page turns and a long life for the book. This is a wonderful collection of piano solos and I recommend it very highly. 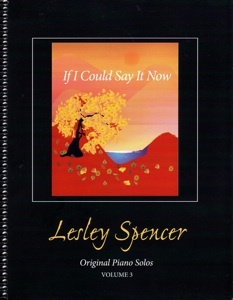 It is available from lesleyspencer.com.